ConFabCafés are intentional networking/workshopping opportunities for U-M faculty, staff, and students interested in interdisciplinary teaching, research projects, collaborative practice, and community impact. For this ConFabCafé session, people from across the university will come together at Stamps Gallery to enjoy conversation, refreshments, and a game (or two or three!) 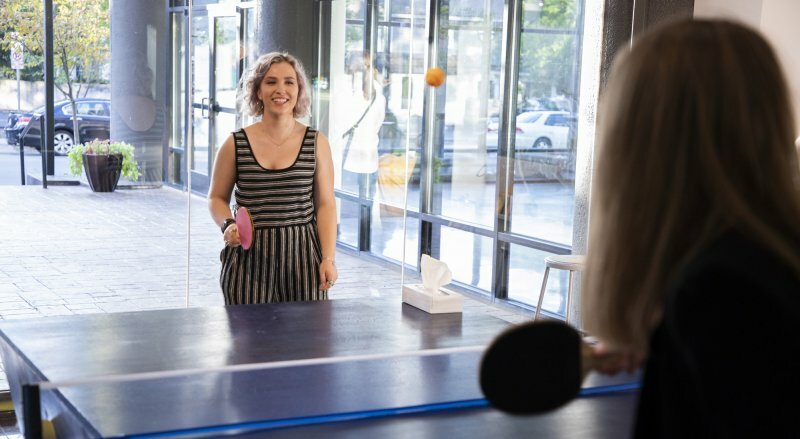 of Ping Pong on Buster Simpson’s (MFA ‘69) interactive installation Prussian Blue (Ping Pong Table). This event is part of Have We Met? Dialogues on Memory and Desire, on view through November 18, 2018 at Stamps Gallery. This event is free and open to the public. Presented in partnership with ArtsEngine.